MAY THE FORCE BE WITH YOU AT LEGOLAND® DISCOVERY CENTER FOR LEGO® STAR WARS™ DAYS! You are here: Home / Dallas/Fort Worth Events / MAY THE FORCE BE WITH YOU AT LEGOLAND® DISCOVERY CENTER FOR LEGO® STAR WARS™ DAYS! Experience LEGO® Star Wars™ Days at LEGOLAND® Discovery Center Dallas/Fort Worth on November 14 and 15. “LEGO® Star Wars™ Days will feature exciting LEGO® activities guaranteed to bring the spirit of one of the most beloved film series of all time to our very own LEGOLAND® Discovery Center,” said Iain Scouller, General Manager of LEGOLAND® Discovery Center. The weekend will feature fun-filled LEGO Star Wars™ activities for all ages including LEGO® Star Wars™ build competitions, a large scale LEGO® Yoda™ group build, meet and greet with 501st Legion costumed characters, Star Wars™ MINILAND invasion and more. 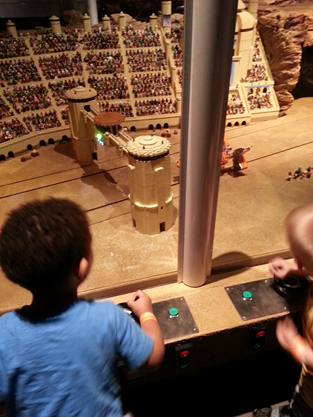 All activities taking place during LEGO® Star Wars™ Days are included in the price of admission to LEGOLAND® Discovery Center Dallas/Fort Worth. For event details and times visit LEGOLANDDiscoveryCenter.com/dallasfw. Hours: Monday – Friday, 10 a.m. to 7 p.m.; Saturday, 9 a.m. to 8:30 p.m.; and Sunday, 10 a.m. to 6:30 p.m. – last admission two hours prior to closing. Tickets: Admission is $21 for guests 3 years of age and older, and free for kids 2 and under. To purchase special discounted tickets visit LEGOLANDDiscoveryCenter.com/dallasfw.